Showing results for tags 'a/c'. These are the basic electronic climate controls for a heat, cool and defrost system. They do not fit easily into the stock 280Z control opening but the housing can be modified. I believe this unit fits the 240Z console better. Dimensions are 4.63-inches wide x 2.44-inches tall x 2.625-inches deep. 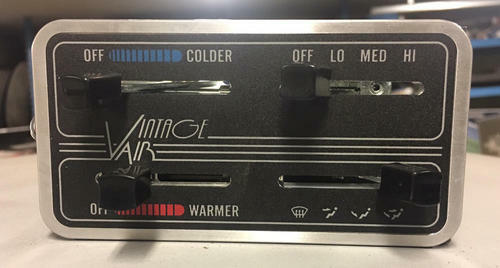 Full installation manual on the Vintage Air website. Sells new for $75 on the website. This has never been used and is perfect. $50 plus shipping. I apologize if this is misposted. I thought about putting it in "interior" but that didn't seem quite right... Has anyone replaced the stock underhood vacuum pump and vacuum bottle associated with the heater/airconditioner box with something else? I would like to delete the stock units and install something hopefully a little more compact somewhere else. Recommendations would be welcome. Thanks. NewGuy146 posted a topic in Help Me !! I have a 78 280z and I get no power to the A/C compressor when I turn the A/C knob on. The last owner said that it worked but didn't blow very cold air and thought that the system needed charging. Took the car in for service and the mechanic said that he couldn't get the compressor to kick on - no power. Not very familiar with A/C systems thought I would ask for things to look for in trouble shooting this problem. Trying to get this solved before the good ole Southern heat kicks in. Also, does anyone know of a good shop in Birmingham, AL that may be able to help? Thanks!! tymarbry posted a topic in Help Me ! !